Is it greedy, in this season of generosity, to feel like two hours of Taylor Mac is about four hours short of the minimum time one wants to spend with this extraordinary human being? The last time Mac was at the Curran, it was with A 24-Decade History of Popular Music in easily digestible six-hour chunks. Those shows were mind-blowing – the kind of immersive, genre-busting, challenging, cosmic experiences that make you re-think just about everything, from what live theater can be to what your purpose is on this planet. 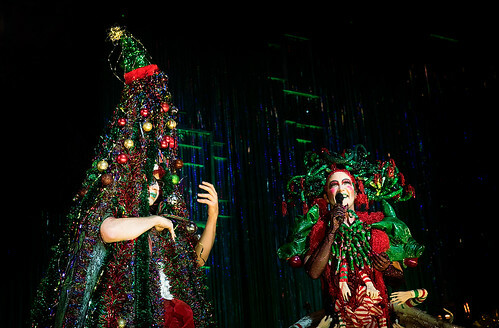 Now Mac is back with a two-hour show called Taylor Mac’s Holiday Sauce, and while two hours is far better than no hours, by the time the show ended, I felt like we were just getting warmed up and ready to do some real work in tearing down “patriarchy as spirituality,” as Mac puts it. This is like no holiday show you’ve ever seen – a Radical Faerie Realness Ritual Sacrifice that involves music and drag and gloriously theatrical excess and full-blown political revolt. Look for eggnog, Rudolph and Hallmark movies elsewhere. We do get a Christmas tree (worn as a costume by Machine Dazzle, who designed the set as well as all the outrageously wonderful costumes) as well as an angel (Gabriel, who strips down to skin glitter on stage before ascending and getting his wings) and a nativity complete with camels, a beer-swilling Baby Jesus and three Wise People who may have caused a stir amid the denizens of Bethlehem. But holiday traditions are more exploded than celebrated here, and it feels so good. If “The Black Angel’s Death Song” by Velvet Underground is your idea of a stirring holiday carol, you’re in luck. That’s how Mac opens the show (accompanied by musical director Matt Ray at the piano and magnificent eight-piece orchestra complete with brass and strings), and it’s our first blast of the Mac voice, that muscular tone that can belt and swoon and hammer and caress. Later on Mac will blend “All Tomorrow’s Parties” (another Velvet Underground tune) with “The Little Drummer Boy,” and then turn “O, Holy Night” into a de-constructed, re-constructed audience sing-along that just may revise how you hear all those classic holiday chestnuts. Mac’s triptych tirade against capitalism includes William Roy’s “Bargain Day” and Frank Ocean’s “Super Rich Kids” capped off with the Rolling Stones’ “You Can’t Always Get What You Want” complete with an elder choir singing on the mezzanine. It’s all in service of Mac’s effort to bring the margins into the center, to re-frame how we look at tradition and why so many parts of the population – queer, gender fluid, female, senior – are kept from the heart of the celebration. Mac also aims to pay tribute to Mother Flawless Sabrina, whose image presides over the increasingly crowded stage (filled with elves and Dandy Minions and a Santa who will ask before touching). A spiritual mother figure to Mac, Mother Flawless is quoted as saying things like, “Reality is a mass hunch” and “Normal is a setting on the dryer” – aphorisms that feel like shiny adornments on this bounteous holiday package. My favorite musical moment in the show is one that highlights something Mac is especially skilled at: building a sense of community among audience and performers. The song is The Pogues’ “Fairytale of New York,” and anyone who knows the lyrics (or anyone who doesn’t) is invited to join the party on the stage, where Bushmill’s and Jameson’s are served in little paper cups. It’s a party you don’t want to see ending anytime soon. Mac commands the stage like no one else. The Machine Dazzle outfits help a lot. The first ensemble includes boars’ heads with apples in their mouths as epaulets and a skirt of elf arms and hands tangled with reindeer antlers. The second is a Nutcracker fantasy in pink with a skirt that doubles as a carousel. Mac doesn’t need all the flash to hold an audience in thrall, but the grand drag is magnificent. It frames a performance brimming with intelligence, ferocity and theatrical charm. That’s why, at the end of two hours, it’s so hard to say goodbye to Mac. Once you’re on the Holiday Sauce you’re well on your way to a case of Macaholism that will last well into the new year. 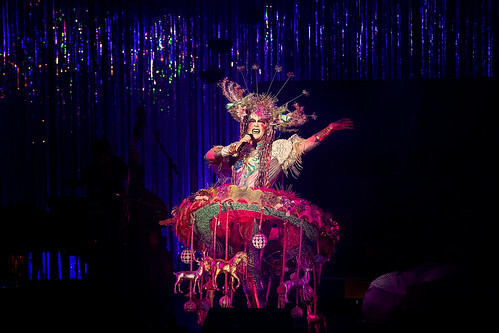 Taylor Mac’s Holiday Sauce continues through Dec. 1 at the Curran, 445 Geary St., San Francisco. Tickets are $29-$175. Call 415-358-1220 or visit sfcurran.com.